Three superyachts have already begun maintenance work at Monaco Marine’s new refit yard Le Seyne-Toulon just weeks after it began operating. 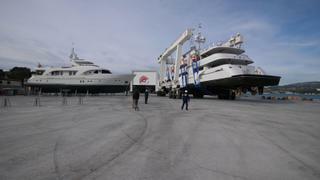 Three superyachts have been hauled out of the water since it opened its doors on November 1. These include the 30 metre Moonen Livadia, which was delivered in 2010 and the 47 metre Swiftships La Polonia. The 54 metre Trinity Yachts Keri Lee III, originally delivered in 2001, was hauled out on November 29 to begin a four-month refit and class registration. The Le Seyne-Toulon yard, located at Seyne-sur-mer in France, specialises in yachts measuring between 30 metres and 55 metres up to 500 tonnes. It can accommodate a total of 28 yachts at one time and is consequently one of the largest sites dedicated to the maintenance of 50 metre superyachts in Europe. Monaco Marine announced the agreement with the port authority of Toulon and the Var region to redevelop the shipyard in October 2013. The site joins Monaco Marine’s wider refit yard portfolio, which also includes La Ciotat, Beaulieu sur Mer and Marseille.